December 9th, 1994. I was hit by a car and suffered from a massive head injury. All this has been discussed in my book, Flight of a Lifetime, which has been available as a book with my new publisher, New Generation Publishing (ISBN: 987 1 84748 307 2) since September 2008 and two years after it was published as an e-book by mardibooks (ISBN: 978 1 909 227 613). 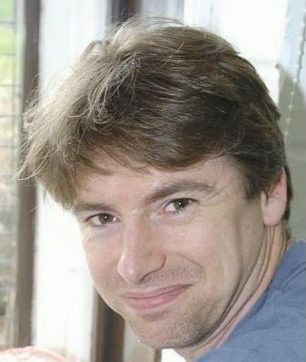 Both versions can be found on Amazon.co.uk using the link ow.ly/DKc3l. In my autobiography I say I died in December 1994 and my heart did stop beating, but the body, somewhat miraculously, carried on going. Whether I died or not, and it is somewhat a moot point, one life certainly ended. When I left hospital in May 1995 though, a new life had been restarted – not unlike a Phoenix rising victorious from the ashes of its own failed existence. Initially I moved back to live with my parents; no longer was I able to live alone in London and look after myself. 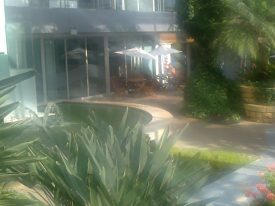 Moreover I was still not able to work and London is an expensive place to live. In those days it was nice to be in the loving arms of my family and to be catered for and looked after. However, it was not long before I started to almost resent my parents for being… Well, parents! I longed to be on my own again and do what I wanted, when I wanted. I was an adult and had left home five years earlier when I went to university. I had started out on my own life and wanted to live that life. My uncle, Brian Salter, was the CEO of Milton Keynes Parks Trust. In their new offices in Campbell Park Pavilion, which I had been to see in one of my weekends away from my third hospital in March 1995, there was a flat above the garages for the Seasonal Steward. He had suggested that I might like to move into this flat and become their ‘caretaker’. 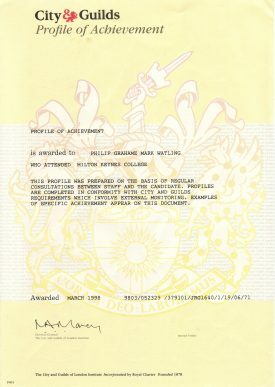 So it was that I moved to Milton Keynes in October 1996. I acted as The Parks Trust caretaker, but this didn’t take much of my day. In fact the point of my ‘job’ was to be there when no one else was so during the day I pretty much had nothing to do – and nothing was what I did to begin with! I rested, I healed, I walked around Campbell Park, I spent time in the Shopping Centre at the far side of the park… Like before, when I first started having weekends away from hospital staying with my parents, I realised doing nothing was boring, but I was lucky: Milton Keynes has so many exciting things happening here and I tried to take full advantage of what was on offer. One of the first things I heard about was from Brian who mentioned that there was a monkey sanctuary in Tinker’s Bridge. People Establishing a Caring Environment (P.E.A.C.E.) 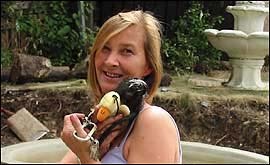 was a charity set up by Monica King (photo Copyright http://www.bbc.co.uk/threecounties, August 2003) to care for monkeys that had been mistreated, abused or abandoned by silly people who could not look after them properly. Basically it was a converted house where the whole of the garden was full of purposely built cages for a variety of monkeys. She soon expanded to care for other animals including an arctic fox called Lucy; a beautiful Caracal lynx called Royal; a hoard of reptiles; some parrots: Alfie who was very talkative and outrageously rude, Sam who squawked annoyingly if he saw you eating, Pepsi, a killer parrot who would bite anything encroaching too close…and three rabbits! Soon she would take in and look after youngsters referred to P.E.A.C.E. by the courts, probation service and social services – and then there was me! 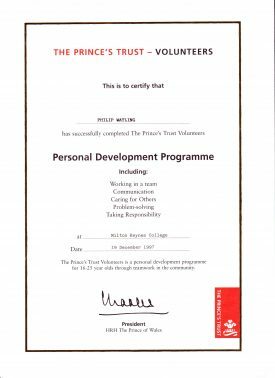 I volunteered there, for four years during which time I heard about the Prince’s Trust Volunteers. The PTV runs for young adults aged 18 to 25… I was 26! This course, which opened new horizons for young people, sounded fascinating though and I wanted to be involved; I had a long chat with the Course Co-ordinator about me deserving to do this following my horrific head injury, and it was voted amongst the other people taking part. The rules were bent slightly! The course runs for three weeks and has a variety of elements to help the volunteers gain a City & Guilds Profile of Achievement. To start there was a Residential Week in Suffolk and we played silly games designed to help us relax and get to know each other well, trust each other and work as a team. I guess it worked – we are still friends now! Following from this was a week, which was designed to further help us trust each other and cement the friendships that we had made by taking us through various team building exercises of the Residential Week. Weeks three through six were spent at the P.E.A.C.E. monkey sanctuary in Tinkers Bridge where we concreted the floors of the cages, built a roof, replaced rotting wood in the cages and painted everything we could see. Then in weeks seven, eight and nine, I had my placement at Woburn Safari Park working everywhere from ‘dangerous’ carnivores to human-friendly animals in Pet’s Corner. The fund raising of week ten enabled us to take out disabled and OAP groups during week eleven, the Challenge Week, styled on the theme of Christmas. All of this hard work was finally showed off in our presentation on 18 December; the final twelfth week having been spent organising ourselves to make it the best presentation ever. They were a trial and I would not last long at any of them for similar reasons as before. Oddly, though, one of the jobs would prove very beneficial: working as a cleaner for The Centre:MK. I don’t think I stayed more than a couple of months, but I learnt that there were things I could do even if no one accepted I could do them. As mentioned in my book disability discrimination and the specific lack of understanding surrounding head injuries is commonplace… The other thing I gained from this experience was knowledge. As part of the job the cleaners get to know staff on the various barrows in the shopping centre, and I did too. Many became friends – some of whom I still have – and knowing people on the barrows spread out into the surrounding shops, be that Boots, House of Frazer, Debenhams, John Lewis; I am well known in the library and at my local bank, Halifax, where comments are raised when I don’t go in for a few days. As for the Japanese noodle bar – I am Wagamama-family! Headway led to CHIS led to work trials led to me getting to know people and their friendship helped me immensely in learning about the new post-accident me and about how to interact with the general public. I stayed at Headway for the best part of a decade until I went to China in 2009. I returned with my new (American) wife, but had progressed beyond Headway. During this decade at Headway I didn’t rest. Heck, I was only there for three afternoons a week and I had tried doing nothing immediately after my accident; I found it very boring and very tiring! So in this new life I kept busy. Three times a week I went volunteering. 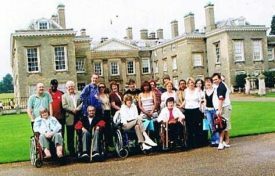 One day was helping at St Francis’s Children’s Service, an adoption agency catering mainly for disabled children – a bit too close for comfort, maybe, though I mainly worked in admin/fund-raising. 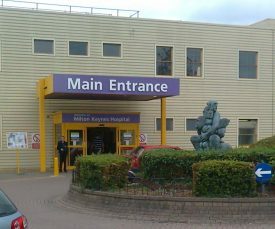 I also volunteered twice a week in the library at Milton Keynes General Hospital, issuing books and magazines, and talking to patients, as well as other volunteers, doctors, nurses, therapists and various members of staff – all of which helped me learn how to interact with different groups of people. I also took a variety of courses including First Aid and Fire Awareness. I also stared to attend classes through ACE: Milton Keynes’ Adult Continuing Education. For many years I studied for a City and Guilds Certificate for IT Users; learning or, often, improving my understanding of Word, Excel, Power Point, Access, DTP, Email and Internet. 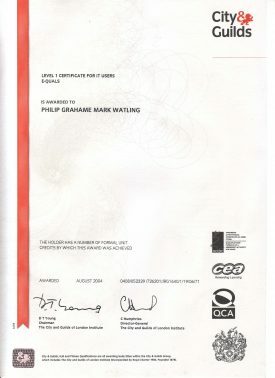 I eventually gained two further City and Guilds certificates. 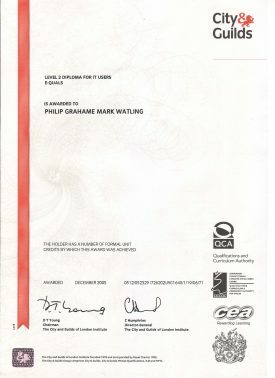 One was a Certificate for IT Users, Level 1 and one was in Level 2. I also took a Russian Course: having a Russian aunt I was fascinated with Slavic script and had started talking to Russians on the internet in the many months recovering from my accident before I started to wake up to my new life. I enrolled on a Russian course with ACE and along with Alan, Susan, Tricia, Martin and others I started learning Russian with the excellent Ukrainian teacher Irina Beleia. 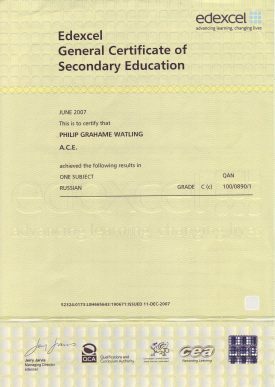 Within a couple of years I took the Russian GCSE and got a C – not bad given my head injury! The greatest innovation from moving to Milton Keynes, since it is still relevant today, happened in the early noughties, shortly after moving to my own flat in March 2000. I had a new girlfriend and she was very insistent that I join a gym and, as if it were a destiny, free trials at two gyms were advertised in the local paper. I tried out both gyms and soon joined Livingwell (later being taken over by Bannatyne’s Health Club), which was located in the Wintergardens. Joining a gym helped immensely with my physiotherapy, which was overseen by some excellent instructors. Over many years, especially at Bannatyne’s, the kindness and friendliness of the myriad staff helped improve me – both emotionally and in my social behaviour. At the end of the day my accident left me disinhibited. I’ll always be disinhibited, but living in Milton Keynes has helped me learn how to cope with others.